•MODFLOW-SURFACT: the block-centered flow package (BCF4) must be used. If the Steady-State Flow option is selected, Visual MODFLOW Flex will prepare the data set for a steady-state flow simulation, and will automatically use the data from the first time period (only) of each boundary condition and pumping well defined in Visual MODFLOW Flex to run the model to achieve flow equilibrium (i.e. a time-independent solution since all inputs are constant). Please Note: if running a steady-state model, at least one boundary condition with a head of known elevation must be specified (e.g. constant head, river stage, drain bottom, general head elevation). If the Transient Flow option is selected, Visual MODFLOW Flex will prepare the data set for a transient flow simulation. During this process, Visual MODFLOW Flex will automatically merge all of the different time period data defined for each pumping well and boundary condition into the stress period format required by the different versions of MODFLOW. This creates a time-dependent flow solution, as the model is being run with different inputs at different times. Steady-State Simulation Time: specified time for the mass balance terms in a steady-state run. 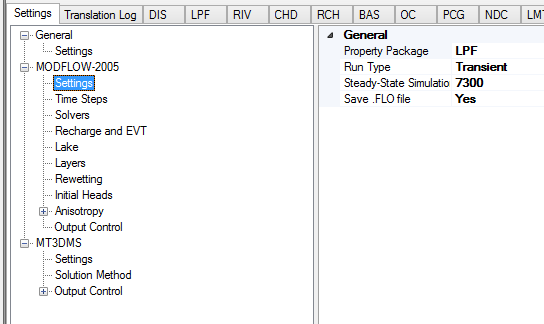 Save the .FLO file: toggle to save the .FLO file which can be used for MODPATH and transport (MT3DMS/RT3D) runs. 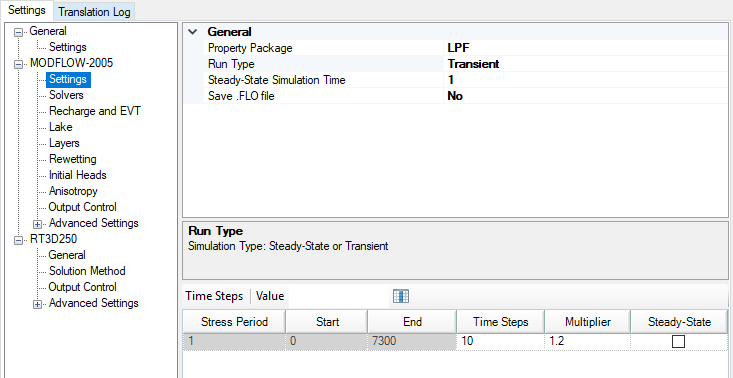 The Time Steps option is only available when you are running a transient model (i.e. when Transient Flow run type is selected). For transient flow simulations, Visual MODFLOW Flex will automatically merge all of the different time periods defined for all of the different pumping wells and boundary conditions into the uniform stress period format required by MODFLOW. A stress period is defined as a time period in which all the stresses (boundary conditions, pumping rates, etc.) on the system are constant. Unfortunately, the data collected for each modeling site is rarely synchronized in terms of stress periods, so Visual MODFLOW Flex merges the time schedules for all pumping wells and boundary conditions to determine the length of each stress period for a transient simulation. As a result, the user cannot directly modify the number of stress periods or the length of each stress period. The Time step options window (as shown in the following figure) is used to define the number of Time steps in each stress period and the time step Multiplier is used to increment each time step size. The Stress Period column indicates the stress period number while the Start and End columns indicate the start time and end time, respectively, for each stress period. Each stress period is divided into a user-defined number of Time steps whereby the model will calculate the head solution at each time step. The default value for Time steps is 10. The time step Multiplier is the factor used to increment the time step size within each stress period (i.e. it is the ratio of the value of each time step to that of the preceding time step). The default value is 1.2. A time step Multiplier value greater than 1 will produce smaller time steps at the beginning of a stress period resulting in a better representation of the changes of the transient flow field. Thus increasing the number of time steps in a simulation may result in smoother head or drawdown versus time curves. The steady-state column indicates if the stress period is transient or steady-state. This option is available if MODFLOW-2000, MODFLOW-2005, or MODFLOW-SURFACT is selected as the numeric engine for the flow model. These engines allow individual stress periods in a single simulation to be either transient or steady state instead of requiring the entire simulation to be either steady state or transient. Steady-state and transient stress periods can occur in any order. Commonly the first stress period may be run as steady state, to produce a solution that is used as the initial condition for subsequent transient stress periods. Visual MODFLOW Flex allows you to define boundary conditions with varying end times; the number of stress periods for the model will be calculated from the end time of the longest boundary condition. If there is a stress period where there are no data defined for a boundary condition, then you will see an entry of "0" in the appropriate package, for that stress period; this denotes that zero cells are defined for that stress period. In the case of pumping wells, you will see a rate of 0 for the well cells.